Edgar Hudson Miller was born in Tacoma, Virginia, on November 21. He probably was born in 1901, although my grandmother Miller always insisted he was born in 1902. He was the oldest of the three children of Elbert Sheffy Miller and Emma Bond Miller, both Virginia natives. He had two younger siblings, Esther and Elbert Kyle. Both Daddy and his brother were always known by their middle names or their initials. The family moved to East Tennessee sometime in the early teens. As Daddy told me the story, Mama Miller, as we called my grandmother, rode the train with the two younger children. He and TiTi, as our grandfather was affectionately known, journeyed by horseback, coming down through the Powell Valley then across Pine Mountain at Pioneer and through Elk Valley to Jellico. My grandfather had a lumber company known as Miller & Company In 1915, he partnered with John W. Kitchen of Ashland, Kentucky, to form the Kitchen-Miller Company He moved to Jellico to head the company’s logging operations in Kentucky and Tennessee. In 1925, Kitchen-Miller and Vansant-Kitchen Company, which had extensive land holdings in North Carolina, merged to form the Kitchen Lumber Company, with my grandfather and three Kitchen brothers owning equal shares of stock. The first operation of the Kitchen Lumber Company was in North Carolina in what is now the Great Smoky Mountains National Park. Daddy had a reputation as a high-spirited young man in his teens and early 20s. Automobiles were becoming a widespread manner of transportation, and Daddy built his own “flivver,” using parts that he cannibalized from buggies. I don’t know where he got the motor. One night, probably after a few drinks and irritated that he wasn’t invited to a big party in town, he drove his homemade car up the steps onto the front porch of the party-giver’s house, much to the great embarrassment of my mother and the amusement of the guests if not the hosts. After graduating from Jellico High School, he went to Vanderbilt University in Nashville, but returned home during his junior year when he became ill with typhoid fever. He recovered from the typhoid, but he never returned to the university, instead going to work for his father in the lumber business. He took a correspondence course in civil engineering and worked as an engineer for Kitchen Lumber Company from 1926 to 1931. 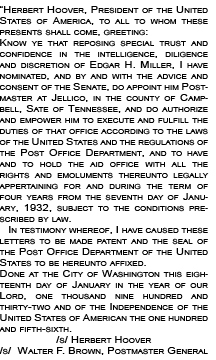 President Herbert Hoover appointed him postmaster at Jellico in 1931, a post he held until a successor was appointed by Franklin D. Roosevelt in 1934. From 1935 to 1939, he was city engineer and superintendent of the Water Department for the city of Jellico. As city engineer, he paved many of Jellico’s dirt streets and installed covered storm sewers throughout most of the town. Daddy also completed a night school course in law in Knoxville, but he never practiced law. He returned to the Kitchen Lumber Company in 1939 and held the post of engineer and general superintendent until 1944. Upon the death of his father in 1944, he became the company’s general manager, a position he held until the company ceased operations in 1950. After the demise of the Kitchen Lumber Company, Daddy never again found a solid anchor, moving from one job to another, mostly in the construction area. He worked in various types of heavy construction—highway, water and sewage tunnels, a sewage disposal plant in Knoxville, and school buildings. He was chief inspector for a Knoxville architectural firm during the construction of a number of schools in Campbell County in the 1950s. Later he was chief field engineer on the U.S. Army Corps of Engineers Little Falls Project of the Washington Aqueduct System in Washington, D.C. He also bought and ran a filling station briefly in East Knoxville and tried a number of other activities. He always got by, but sometimes just barely. But whatever he did, Daddy did it with great gusto and vigor. I remember visiting him on a particularly tough job—a highway tunnel on a mountainous road near Sylva, North Carolina. He was jubilant because he had completed the tunnel within a quarter of an inch of the centerline, something almost unheard of for a tunnel built through solid rock on a curve. He went into various hobbies with equal gusto. Surprisingly, perhaps, he got into growing roses at one point while we lived on Fifth Street. He didn’t just plant them, but tried successfully to graft them, creating a new hybrid rose of his own. He got into photography at one point, which led to my own interest in it. Even though Daddy did not have a formal college degree, I suspect he knew more about engineering, particularly surveying and civil engineering, than most college graduates. He even dressed the part. His uniform was khaki pants and a white or khaki shirt whose pocket would always be filled with those tools of the engineering trade: various sized pencils, the inevitable slide rule, a small notebook. And he always wore a snap-brim hat, felt in the winter and straw in the summer. A little over a month later, the company asked him to go to Huntsville to check out the possibility of opening that branch office. He arrived home excitedly telling Mother about the upcoming trip. Then he laid his head back on the chair. Mother thought he was resting, but then realized that he wasn’t breathing. He had died, quietly and without fanfare, but at a peak of enthusiasm for life and his lot in it. Even though those last years were undoubtedly stressful and difficult, I never heard Daddy complain. He was always upbeat, always looking forward to new challenges. Daddy’s greatest attribute, in my eyes, was the way he dealt with people. He measured a man not by his pocketbook, his level of education, his culture or his power, but by his merit and his values. He admired people for what they accomplished and how they accomplished it, and that ranged from day laborers to those in power. He cared nothing about their color, their creed, their station in life, their economic status or their handicaps. And he was intensely loyal to his friends and those who had in some way befriended or supported his family. He couldn’t abide those who lied, cheated or otherwise failed to keep their word. In my father’s generation, a “man’s word is his bond” was still meant what it said. The best example of his rage over those who did not keep their word came in 1950. That year longtime Second District U.S. Representative John Jennings was being challenged in the Republican primary by an upstart lawyer from Scott County, Howard H. Baker Sr. Many people, including my Uncle Kyle, thought it was time for Jennings to step down, and were supporting Baker. My grandfather Miller, who had amassed a certain amount of political clout in northern Campbell County, had always supported Jennings, and after his death Daddy had continued to support him. Also, my Grandmother Baird had virtually raised Jennings during a crucial period of his adolescence, a fact Jennings recognized at her funeral. Jennings had begun his practice of law in Jellico after graduating from college, and again lived at the Baird home for a period. So Daddy felt obligated to support him, thus splitting the Miller family. Jennings, in turn, talked Daddy into running for the state Senate from the district that then covered, as I recall, Campbell, Anderson and Union counties. I was 15 that summer and I went with Daddy throughout the area, tacking up campaign posters, meeting people and attending rallies. He got a hearty welcome everywhere he went. Midway through the campaign, however, something happened. Daddy was convinced that Jennings had reneged on certain promises he had made to Daddy to get him to run. In short, Jennings had not kept his word. Daddy was furious. I don’t recall the details, but I went with him on a blistering hot July Sunday afternoon to Knoxville where he met with Jennings and his cronies in a suite at the Farragut Hotel. It was literally the smoke-filled room, filled with politicians all of whom, it seemed, were smoking huge cigars, the thick blue smoke forming a cloud under the ceiling. It’s a wonder I didn’t suffocate. Daddy left me in the living room of the suite while he met privately with Jennings and a couple of others. Not long after the meeting started, I could hear the men shouting at each other behind the closed door. The argument went on for a while. Then Daddy stormed out of the room and said, “Let’s go.” We left. He never told me the details of what had gone on, but the next day he withdrew from the primary race and left it to another Jellicoan, Hendee Blankenship, a South Main Street merchant. It was too late to take his name off the ballot and Daddy still got a lot of votes got the most votes. After that, Daddy didn’t openly oppose Jennings, but the word got around after Daddy withdrew from the race. Baker soundly defeated Jennings, ending a career in Congress that started when he was elected in 1939 to fill the unexpired term of another Campbell County native, J.Will Taylor. That was Daddy’s first and only campaign as a political candidate. Daddy was scrupulously honest, and I’m sure that’s why he never really was able to amass much in the way of material goods in his lifetime. He would not compromise his principles for any reason. I was with him once when he was working as the architect’s inspector on a number of school buildings being built in Campbell County. He discovered that a contractor was not following specifications, and called the job supervisor’s attention to the problem. The man blustered that what they were doing was just as good as what the architect had called for and whined that to change it would cost too much money. I don’t know if he offered Daddy a bribe, but I suspect he did. In any event, Daddy never considered it. “Well, you’re going to have to tear that wall down and start over,” he told the man. They argued about it some more, but eventually the wall was torn down and rebuilt to specifications. He was a master workman, proud of his labors, with an inordinate love of the great woods and the mountains. Some had college degrees, some high school diplomas, some no formal education. He was religious, wicked, gentle and brutal. He worked hard and played hard; he had lusty appetites and satisfied them. He was generous to a fault, honest and willing to impart his knowledge to any youngster anxious to learn. In a sense, Daddy could have been describing himself for he fit all those criteria. As can be seen in his monograph, which never was published, he also was a great storyteller. He could enthrall his audiences, one person or 20, for hours with his tales of the logwoods, of his early days in Jellico, of his time in the Navy. He was in the service less than 90 days, and yet he had more stories than I got from three years in the Army. Sadly, I remember only bits and pieces of his stories. Happily he left some samples in his monograph. After the Japanese bombed Pearl Harbor on December 7, 1941, a large number of Jellico’s young men either volunteered for or were conscripted into military service. Daddy, then in his late 30s, tried to volunteer, but was turned down because he was “too old.” Then it was announced that the Navy was forming an elite Construction Battalion, quickly named the “Sea Bees,” and they were signing up men with significant construction experience no matter what their age. This was right down Daddy’s alley so he joined, going in as a chief carpenter’s mate, the highest enlisted rank in the Navy at the time. Daddy’s Naval records list him as 5 feet 10½ inches tall weighing 135 pounds. I don’t think he ever weighed more than 150 pounds, despite his healthy appetite for fatty foods most of his life. He left in October and after being processed into the service in Knoxville, he was sent to Norfolk, Virginia, where they did a more thorough physical examination, discovering a number of problems, including a spot on his lung that probably dated from an earlier bout with pneumonia. He was deemed medically unfit for service and was discharged on December 4, 1942, arriving back in Jellico in time for Christmas. It’s hard for me to believe in retrospect that he was gone such a short time, because to my young mind it seemed like an eternity. I’ll never forget the joy I felt when I saw his face in the window of the bus at the Greyhound station that December. He was wearing his full dress uniform—for the last time—and I was the proudest guy in town.